Which Way? Spoiled for Choice! 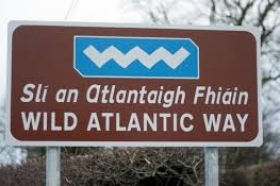 For 2019 we have organized three especially rich and interesting tours for June: a close look at Cinematic Ireland--the places where Irish history was made and inspired some of the best Irish and world film, a week of golfing along the Wild Atlantic Way and a fun immersion into Irish scenery, customs, and craic, and a "best of" tour celebrating what we know best: Ireland’s magnificent northwest in Sligo and Donegal. Additional tours can be arranged for your family or small group. Tell us when you want to go, for how long, and the kinds of things you would like to see and do. We will do the rest, and deign a unique experience in Ireland you will never forget. We also offer short- or longer-term chauffered tours for one to four people. Again, you tell us where and what you would like to do in Ireland, and we will take it from there. In this special small-group tour, Ireland is ready for its close-up as we travel to some of its most scenic locations with an eye to the films that have been inspired by them and the history and culture they represent. Each day we will focus on several key aspects of Irish history, customs, and traditions, using the scenic richness of our route as our classroom and cinema! 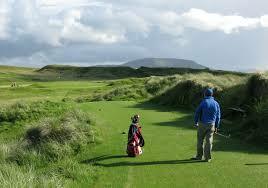 Enjoy a week of golf, sightseeing in the spectacular Northwest of Ireland. We will be based in Sligo, Yeats’s "Land of Heart’s Desire," and will alternatve between rounds of golf in nearby championship-level courses with excursions into the rich sceneray of Counties Sligo, Donegal, and Mayo. This is the perfect relaxing holiday in Ireland. Non-golfers will have alternative activities planned. For this special tour we have organized the best of what we do, focussing on the West coast of Ireland, along the Wild Atlantic Way. 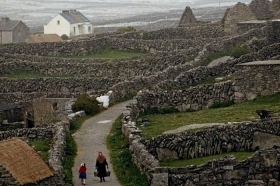 Based in Sligo and Galway, we will explore the heart of Yeats Country, along the famine trail in Mayo and Connemara, to Galway City, our homebase for excursions to the Aran Islands, the Cliffs of Moher, the Burren, and the monastic site of Clonmacnoise. The tour will feature amazing scenery, Irish literature and music, and encounters that you will be hard pressed to duplicate on your own. Join us for this special small-group experience.